What can I say about this awesome comedy? 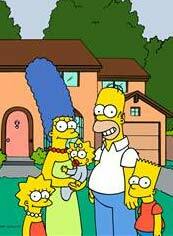 For more than two decades we’ve been treated to the buffoon-istic stylings of Homer and his crazy family. And for us religion, faith and spirituality geeks here at Idol Chatter, “The Simpsons” provided ample fodder for the stuff we revel in: From Apu’s defense of Hinduism to Rev. Lovejoy’s unique take on Christianity to Homer’s, well, Homer’s “relationship” with God, “The Simpsons” covered it all. From Dena Ross: In the episode “I D’OH-BOT” the Simpson cat Snowball II is run over by a car and dies. Lisa gets another cat, Snowball III, from an animal shelter, which then drowns while trying to grab fish from a fish tank. She then gets another cat, Coltrane, but he jumps out of the window and dies after listening to Lisa saxophone playing. After the animal shelter refuses to give Lisa another cat, she sits outside and pets a leaf saying that maybe she wasn’t meant to have a cat. Suddenly what looks to be an angel appears. However, it turns out to be the Crazy Cat Lady. She throws a cat at Lisa–which miraculously, escapes death. She names the cat Snowball II. Catch a compliation of the Crazy Cat Lady here on Youtube. Rev. Lovejoy: No, but He was working in the hearts of your friends and neighbors when they came to your aid, be they [points to Ned] Christian, [Krusty] Jew, or [Apu] … miscellaneous. Apu: Hindu! There 700 million of us. Rev. Lovejoy: Aw, that’s super. From Michael Kress: “Krusty’s Adult Bar Mitzvah”: After discovering he cannot get a star on Springfield’s Jewish Walk of Fame because he never had a bar mitzvah, Krusty joins thousands of Americans who are moved to celebrate this teenage coming-of-age ceremony as adults. Actually, he has two bar mitzvahs: One big splashy one that ends up as a reality show, the other is quieter and more intimate, intended to reconnect with his estranged father. The Flanders family attempts to baptize Maggie while she’s in their foster care. When Lisa disapproves of “Whacking Day” (where people whack snakes), Rev. Lovejoy insists God approves of the holiday and holds up the Bible. Lisa: Let me see that. Homer is trying not to eat a pie that Marge baked. He says “God, if you want me to eat this pie, please give me no sign.” Nothing happens, and Homer eats the pie. From Ellen Leventry: I love the time when Homer thinks he’s talking to God, but it’s really a waffle Bart stuck on the ceiling, and Marge knocks it off into his hands–and he eats it. Homer coined the classic phrase, “Sacrilicious.” I use that phrase all the time! As for me–I’m not totally well-versed in everything “Simpsons,” but I loved all of it–everything mentioned by the other bloggers. If this show is this good on television, imagine how hilarious Homer and the gang will be on the big screen when their movie comes out this summer.